The Kamila vase enchants with both its characterful simplicity and its beautiful details that are characteristic for the world-famous Scandinavian design. 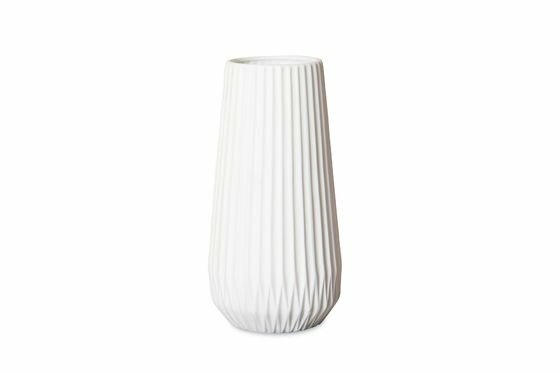 This vase is entirely made of matte white ceramic and shows proudly its vertical lines, which build the structure of the vase. The height of 28 cm is perfect for large flower bouquets. The neutral colour of the vase Kamile enables endless colour combinations. "I am very satisfied with this vase. It is very nice and of good quality. As described on the website"
"Beautiful design vase both functional and decorative"
"Very beautiful and well wrapped, thank you"